Engine/Moteur. Moteur Bernard W110, 4cv at 2500 tp/m, single cylinder, 4 stroke, OHV valves, Alésage 64mm x Course 64mm. Cylinder 206m3. Cylinder in aluminium, with the cylinder bloc and inserts in special heat resistant metal. Cylinder head hemispheric type. Pistons aluminium-silicon-copper mix high wear resistance. Piston rings chromed for smooth long life. Push rods made from duralumin, regularable. The crankshaft (villbrequin) mounted on bearings and tapered bearings. Read more about Bernard engines/moteurs here. Carburateur. Solex 22 NH or Zenith 22 RX both automatic. Oil filter. Immersed in a bath of oil. Lubrication. Oil splash and spray from sump and pressure system. Magneto/spark. Generated from a magnetic system. 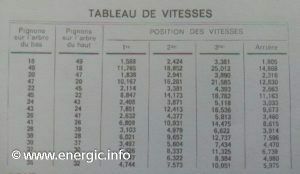 Regulateur centrifuge. Gears. 3 forward and 1 reverse gears, using a second sprocket/inversion you can get 6 forward and 2 reverse. (Inverser Sprockets 18 49 teeth). Further combinations of gears can be obtained at additional cost. Clutch. Multiple discs immersed in oil. Soft and subtle, enabling smooth transition in gears and measured starting. PTO. Rear (prise de force) 170 – 1150 tr/m with 3 sizes of poulies 110 -150 and 150mm. And in all cases the poulie front can act as a PTO. Steering. By directing the handle bars, handle bars been adjustable for height. Additional equipment. Brakes, Fully automatic wheel width regulation. potato lifter/arrache pomme dr terre, barre de coupe 1.45m, various plows (15 – 22cms) – brabant, buttior, bineuse, charrue simlpe 3 types, bi-soc plows, cultivateurs, expirpateur 5 dents, rotivator/fraise rotaive – 350/500mm, harrow/herse, wheel weights/masses, extra sprockets in the gearbox to double the gears, poulie 110mm, various towing brackets/attelages, sprayers/ pulverisateur 100liters- pipe- 1 lance, metal wheels/roues méttaliques, seed planter/semoir, winch/treuil and various variations on wheel sizes and dimensions. Energic motoculteur 220 variable rotivator width. Wheels. Pneumatic Tyre wheels 400 x 12 (hoeing/weeding) or additional cost option 500 x 15 (limited ploughing) or 650 x 16 (ploughing). Blockage independent for each wheel. With the option of “Moyeux auto-réglables” you can alter the width of the motoculteur between 50cm and 80cm, depending upon the size and dimensions of the wheels. Energic motoculteur 220 variable wheel width easily adjusted. Brakes. Drum type, independent and regularable. Hitch. Manual universal hitch with metal pin to attach diverse ancillary equipment, plows, hoes, etc. Paint special polymérisée. Energic 220 motoculteur with rotivator. Weight. 220 kgs With additional wheel weights of approx. 23kgs single or (46kgs) double. Also it is possible to fill the tyre with water for extra traction and weight. The 220 series uses the same moteur – boite – pont formation that is rigid with exceptional strength, adopted from the tried and tested 409 motoculteurs. Transformed. Rapidly into a winch, grass cutter etc., with the correct 200 series adaptions as optional extras. 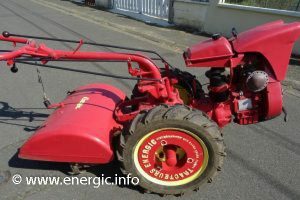 Energic 220 motoculteur transformed in to a grass cutter/faucheuse. Energic 220 motoculteur transformed in to a scraper/dozer or snow plough. Energic 220 motoculteur with Sprayer. Energic 220 motoculteur with rear scraper. 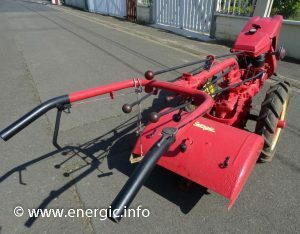 Energic 220 motoculteur with plough 2. Energic 220 motoculteur with rear hoe/tines. 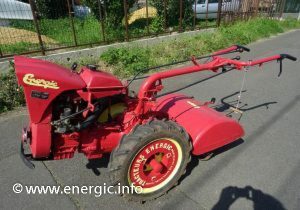 Energic 220 motoculteur with plough. Energic 220 motoculteur towing remorque.